In January this year we decided to take the children on an unconventional trip, a cycle trip to a small village near Hyderabad. The idea was not only to appreciate and enjoy nature but to understand nature in its raw form and to deepen our relationship with it. Here is a small recount of all that happened. 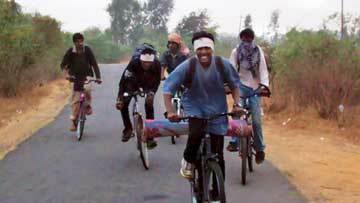 We would start cycling from Hyderabad, and go towards a village 50 km from the city, stay there overnight and come back the next day. We would not use any money during the journey and would work out ways to arrange for food, place to stay and other necessities. One of us would carry some money which was to be used only in the case of an emergency. We would not carry cell phones. One phone would be taken, again to be used only in case of an emergency. We would not carry more than a total of 2 loaves of bread to be used when starting the journey. The idea was for the children to realize how difficult/easy it is to fend for oneself and arrange for basic necessities. The next few days, children tried to convince their parents to allow them to undertake this arduous journey. Finally out of seven children, four decided to come for the trip. Six of us (4 children and 2 teachers) began our journey at 5 a.m. when it was still dark. We had barely hit the highway when the first tyre gave up. There was no cycle shop visible anywhere. We did not know what to do, when someone told us that there was a cycle shop about 2-3 km ahead on the same road. We managed to reach the shop and tried to explain to the cycle shop owner the nature of our journey. We asked him if we could use some of his equipment for free as we had no money to offer him. He was reluctant in the beginning but finally let us use the tools. We repaired the puncture ourselves. Thankfully we did not encounter another cycle-related emergency for the rest of our journey. The onward journey was full of excitement and we took a total of two breaks – one near a lake to have breakfast and the other near a forest nursery to see what was growing inside. We also stopped to look for some work at a tea shop in return for some snacks but had no luck. We reached Mulugu around noon. It was the native village of one of our students who had come with us. However, he along with his parents had moved to the city. He was able to arrange some rice, salt and utensils for us. After some deliberations we decided that we would stay out in an open field. We took rice and utensils and cycled to a nearby farm. Near the farm stood a huge tamarind tree. We parked our cycles and decided to take refuge under the tree. The next big thing was food – we were all very hungry and some uncooked rice and a little salt was all that we had. We divided ourselves into smaller groups – some went in search of water – some in search of vegetables – some to collect firewood. After about an hour of talking to people, telling them our story and asking for work, we were able to get some water, and some tomatoes. Some of us climbed the tree and plucked a lot of ripe tamarind. In the mean time, the chullah was ready to be used. With the tamarind and tomatoes in hand, we cooked the most delicious Rasam and Rice meal. One of us knew how to make plates from large leaves. Plates were ready and food was served. Never before had such a simple meal tasted so delicious. The afternoon was quite pleasant. Some of us took the onus of singing songs and playing dholak and disturbing those who wanted to take a nap. Soon, in an hour or so, we were ready to cycle again. We decided to explore the village, also try and find food for the night. We kept all our bags high up on the tamarind tree and cycled to another village nearby called Wargle. The atmosphere was very peaceful. People were busy sowing rice. Part of the evening was spent in silently observing the sunset and part in playing Kabaddi with kids from the village. After the game and after having heard our story the kids offered us some more tomatoes from their farm. It was tomato day for us. We went back and this time decided to cook tomato rice. It had grown dark and we realized that we had used up all the water. Two of us went out in search of water. There was no light to be seen anywhere and we had no idea in which direction to go. After half an hour of random search, we found a water tank literally waiting for us. We heaved a sigh of relief, filled our pitcher and bottles with water and ran back to our tamarind tree. The dinner was equally delicious and fulfilling, and the atmosphere had become even more peaceful. We spent some time looking at stars and talking about the simplicity of life in a village. Some children talked about how we neglect and many-a-time undervalue simple stuff in life like the food at home. We were all tired and while counting the stars dozed off. But we were not destined to sleep that night. It had become very windy and cold. Finally we all decided to give up fighting the wind and lit a fire instead. The rest of the night was spent talking about ghosts, scaring people, getting scared, laughing and jumping around the fire. Well, there was no waking up. We hadn’t slept at all – thanks to the cold chilly wind. Morning was well spent in looking out for a bush or a hideout to defecate, and neem branches to brush our teeth. We heated the leftover rice and ate it for breakfast. Soon we took our cycles and started on our journey back to the pavilion, singing a song we had learnt together at CFL. The return journey was more tiring and we had to stop a couple of times to take rest and drink water. We also stopped at a temple to eat the sweet that was being offered as prashadam. As we cycled from the peaceful village environment to the chaotic city, we could see the change in the atmosphere. The skies were no longer clear. The cars were honking and trying to steer us out of the road. While cycling I remembered what Fukuoka had written in his book ‘One-Straw Revolution’ – “A child’s ear catches the music. The murmuring of a stream, the sound of frogs croaking by the riverbank, the rustling of leaves in the forest, all these natural sounds are music – true music. But when a variety of disturbing noises enter and confuse the ear, the child’s pure, direct appreciation of music degenerates”. The author is currently working at Centre for Learning, Hyderabad. He can be reached at 27amitd@gmail.com.